The course of the Golf Club was designed by the world class championship golfer and golf course designer, Christy O'Connor Jnr. It is a more than 100 acres, 7287 yards 18-hole golf course dotted with lakes, being built to meet USGA standards in order to make it suitable to host world golf championships. According to the plans the Hungarian Open will be held here in 2012 entering Hungary into the global golf circulation, raising Bicske onto the level where the Hungaroring raised Mogyor�d. The course will cater for both high and low handicaps by providing up to five different sets of tees on each hole. The sunshine rains down on the area for an average of 2000 hours from April until November getting the time spent with racing and practicing to be the greatest pleasure. The clubhouse of the Golf Club and the five-star hotel with wellness- and conference centres ensure convenience and an exclusive service for both golfers and non-golfers. "Budapest is one of the most beautiful capitals of the Central European region and one of the preferred Eastern European tourist destinations, gracefully sited on both sides of the famous river Danube. Just thirty minutes away from the majestic city I was taken to this wonderful site of over 750 acres with natural rolling terrain and a breathtakingly beautiful lake. I knew immediately that I had the real ingredients to build a true Championship Golf Course. This spacious site will host numerous types of accommodation including apartments, villas and town houses, and will be an exceptional business and holiday destination for both golfers and non-golfers alike. The design of the golf course will cater for club golfers of both high and low handicaps, and will include up to five different sets of tees on each hole. The golf course will be built to full USGA standards incorporating a Hotel and Convention Centre. We have already agreed terms to host the Hungarian Open in 2010." The layout and planning of Budapest Gate allow for spectacular views and breathtaking scenery to be devoured from every angle whether it be lounging at the lake-side beach, scoring birdies while parading the golf course or simply by opening the window of any villa, apartment or suite. The championship golf course of the Budapest Gate Golf Club stretching over more than 100 acres has been dreamed into the landscape of Bicske by the legendary golfer and golf course designer Christy O'Connor Jnr. O'Connor, who has been a professional competitor since 1967, was in the front-line for two decades permanently. He gained seventeen victories in seven countries. He represented his country fourteen times on such reputable cups as the World Cup, the Henessy Cup or the Ryder Cup counted as the most prestigious cup of the golf. He gained his most memorable victory at the Ryder Cup 1989, when, eclipsing the world champion Fred Couples, he finished the game with one hit vindicating the honour of the Old Continent. Since his retirement he has mainly been occupied in designing golf courses. 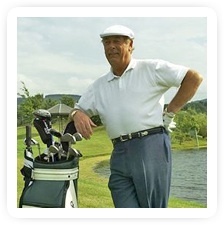 He has designed numerous 18- and 9-hole courses from Ireland through Portugal and the Caribbean to the United States. He took active part in designing and constructing 39 golf courses just in the past eight years. The naturally rolling countryside and the breathtaking lake near Bicske fascinated him at first sight. According to him, he knew immediately that all ingredients of a championship golf course were to find there. O'Connor has other connections to Hungary as he is the honorary president of the Hungarian Golf Association. The head of the association, Zolt�n Tringer handed over a crystal to him symbolizing his honorary presidency right at the Budapest Gate Golf Club foundation-stone ceremony. The clubhouse belongs to the 7287 yards golf course built up to the international standards, it is equipped with all the modern facilities that make the game as joyful as possible. The building has huge windows and terraces, thus presenting breath-taking view over the ambient landscape of Bicske and the multifunctional lake of the club. The club-house with the caf�s and restaurants will offer an oasis to those who would like to relax from the challenges of the course. 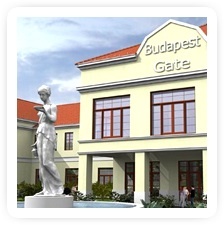 We are looking forward to welcoming You at the Budapest Gate International Golf Club as a resident or as a visitor.